Turkmenistan’s recent history and current circumstances can be partially explained by its reliance on two commodities: cotton and gas. Similar to Uzbekistan, Turkmenistan was turned into a cotton monoculture by the Soviets, and it remains among the top ten producers globally. This, however, comes at a cost to the people, and thus to the government’s revenue stream. Every year, the regime forces thousands of government employees and children to go to the cotton fields—a tactic that most likely prompted the US to ban imports of cotton from Turkmenistan this year. Inefficient irrigation for cotton cultivation contributes to Turkmenistan wasting water on a huge scale, with per capita consumption three and a half times that of the US. Turkmenistan is also home to the world’s fifth largest natural gas reserves. With most other branches of the economy in neglect, gas revenues have been the main source of government revenue—almost 70 percent. This revenue contributes to Turkmenistan’s higher average income compared to its neighbors, although income inequality is also high. All its gas wealth belies a more fundamental problem, however: access to markets. Russia ceased purchasing Turkmen gas in 2016, when reselling turned out to be unprofitable. After a dispute over payments, Turkmenistan ended gas deliveries to Iran, which also cut off a potential transit route to Turkey and Europe. Demarcation disputes among the Caspian Sea have hampered plans to construct a gas pipeline to Europe along a different route. China is currently Turkmenistan’s only major buyer of gas, and Turkmenistan its main supplier. Since Chinese loans funded the gas pipeline between the two countries, China purchases Turkmen gas at a discount and thus holds substantial leverage over the government. Having China as the only major customer—and at a discount—has severely cut government revenues in recent years. At the same time, the government has proven unable to diversify the economy to cope with the situation. These challenges are all exacerbated by the government’s ongoing unnecessary and lavish spending. Ashgabat, the country’s capital, boasts extravagant marble buildings and monuments. In preparation for last year’s Asian Indoor & Martial Arts Games, a largely unknown sports tournament that attracted few visitors to the isolated country, the regime spent billions on an oversized airport and sports arenas. The government is so cash-strapped that it held salaries in arrears for its employees, including police in the capital, for months. On top of that, a voluntary “donation” to the Games was deducted from salaries once they were paid. Meanwhile, the country’s currency, the manat, has lost much of its value, and year-to-year inflation is currently estimated at 300 percent. Unemployment most likely exceeds 50 percent, though official figures are difficult to come by. Government subsidies that once provided free gas, water, and electricity were mostly cut in the last few years. Access to healthcare is still nominally free and universal, yet the level of treatment and accessibility is low. Turkmenistan has the lowest life expectancy and one of the highest rates of child mortality in the former Soviet Union. Homosexuality is considered a disease to be treated by medical institutions, while new cases of HIV are claimed to not exist. For almost a year, there have been regular shortages of basic staples like flour, and of medicine. Along with long queues to secure basic goods, these are the most obvious signs of Turkmenistan’s economic crisis. As elections—including the 2017 presidential elections where President Gurbanguly Berdimuhamedow won 97 of the vote with 97 percent turnout—are a farce, people are increasingly hoping to find opportunity outside the country. There are, however, almost daily reports that people are prevented from boarding their planes, in a government effort to curb emigration. The presence of individuals to remedy the situation is also limited as the quality of education in Turkmenistan remains quite poor. Much of the curriculum in schools is focused on indoctrinating students in the cult of personality around President Berdimuhamedow, and internet penetration is very low. President Berdimuhamedow also regularly reshuffles or purges top levels of his administration, forcing officials to prove their loyalty to him, fend off competitors, and nurture their patronage networks to demonstrate their worth. Accordingly, many civil servants are inadequately prepared or unwilling to tackle the economic challenges for fear of losing their position. Turkmenistan, despite its isolationism, is geopolitically significant. Its systemic and deeply-rooted deficiencies thus have wider implications. Turkmenistan borders Iran, with which it has cordial, albeit strained, relations. More importantly, Turkmenistan borders Afghanistan. Two million ethnic Turkmens populate Northern Afghanistan. As a section of a planned pipeline to India through Afghanistan is under construction in this area, maintaining relations with Afghanistan and keeping the border secure are of utmost importance to Turkmenistan’s foreign and economic policy. With the surge of the Taliban and ISIS in regions neighboring Turkmenistan, clashes with Turkmen troops at the border have increased. Turkmenistan’s conscripts are unfit to tackle this challenge. The army suffers from corruption, underfunding, inadequate training, and poor morale. Incursion into Afghan territory and deals with Turkmen warlords in Afghanistan are inadequate fixes to secure the border, as the Turkmen government is still reluctant to accept external assistance. In the short run, it is unlikely that radical groups will gain ground in Turkmenistan, but in the long run, given the weaknesses of the Afghan government and Turkmenistan’s inability to secure its borders, the country may get increasingly destabilized from the outside. 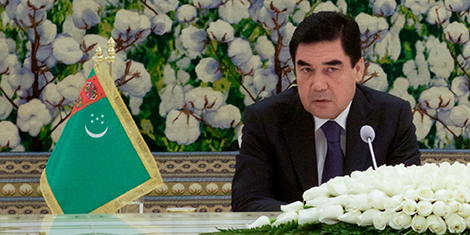 Turkmenistan’s wider geopolitical aspirations stand in contrast to the reality it is facing. For years, and increasingly so since the announcement of China’s One Belt, One Road initiative, the government has demonstrated a desire to become a regional hub and transportation corridor. It has constructed railways, pipelines, and trade facilities to that end. These aspirations are, however, unlikely to be realized due to the country’s heavily restricted immigration policy and poor investment climate. With virtually no organized political opposition or civil society, the current government will remain firmly in place. Small protests against shortages of basic goods and new taxes and fees pose little to no threat to the status quo. Although the government has initiated minor reforms and may be able to ease relations with Iran and create another gas revenue stream, rampant corruption, poor education, and lack of transparency will make it impossible to remedy the country’s problems. Without adequate solutions, domestic discontent will increase over time, and with the rise in security challenges it cannot meet, Turkmenistan will be facing difficult circumstances for the foreseeable future. Only in the promise of younger bureaucrats who are educated abroad rising through the ranks can there be the possibility of a change in course. Given the country’s post-Soviet history, this is unlikely to happen anytime soon.